Market is likely to take a small pause or downward minor move and then move further up towards 6300. All our positional calls should be held with stop loss. Right now we are long in L&T, Tata Steel, Tata Motors, Asian Paints, Wipro. 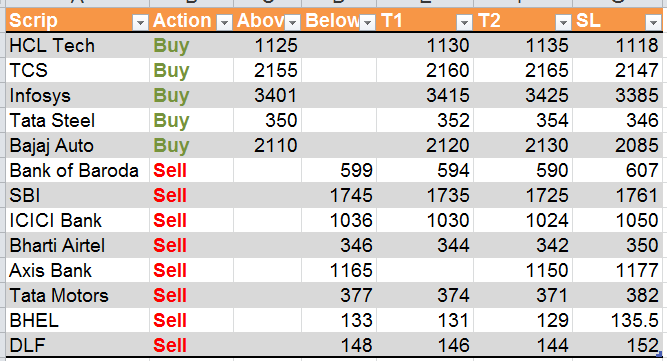 We booked 50 pointsprofits in Maruti bought at 1630. The level which was mentioned yesterday 6165 still remains the key level. Below this market will remain negative and a move towards 6100. We had excellent results from pre-market calls on Nov 19. Readers made good profits. Please see below link for pre-market calls and the results. We opened several positional calls yesterday. Please read the below article to have a look. Today, I am adding two more stocks to this list. Holding period is 2 to 3 weeks. 1. L&T - Buy above 982 for a target of 1000 , 1020-40 with SL at 924. 2. 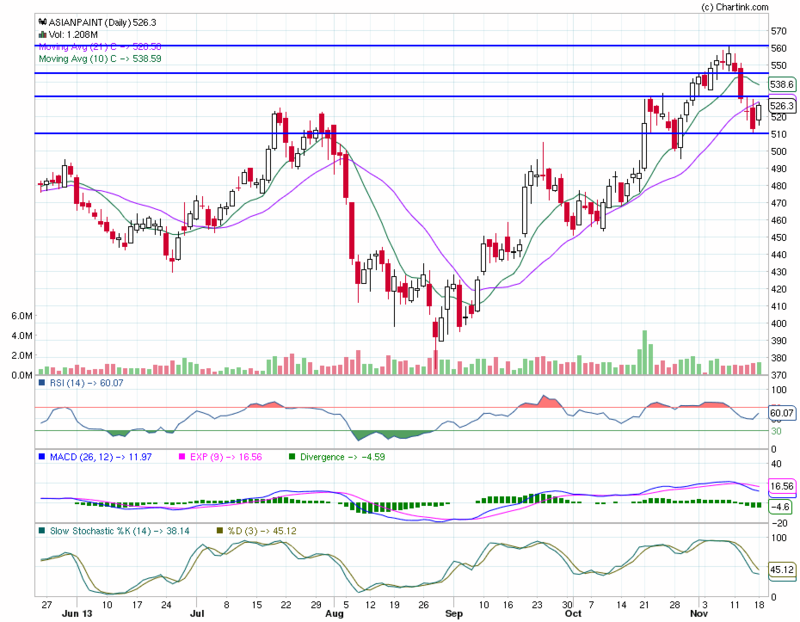 Asian Paints - Buy above 531 for a target of 540-550-560 with SL at 509. 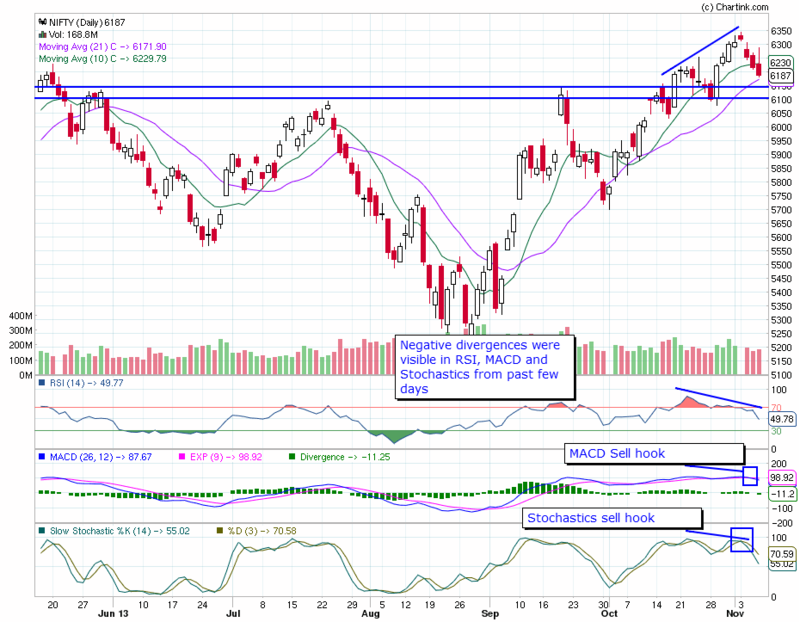 As written yesterday, Nifty uptrend has resumed and is likely to move up towards 6300 level. 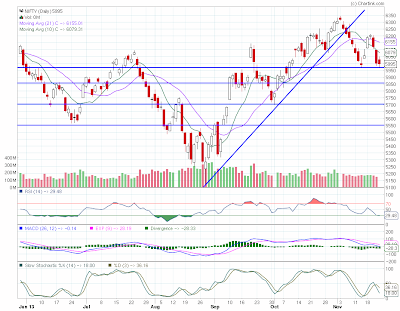 Markets made a fall from above 6300 levels to the support of 5980-6000 and bounced back smartly. Further upmove to the levels of 6250-300 is possible. For the trading on Nov 18, 6065 should be held for the market to be positive. Bullish momentum will be in tact above 6100. Support below 6065 is 6025-6000. 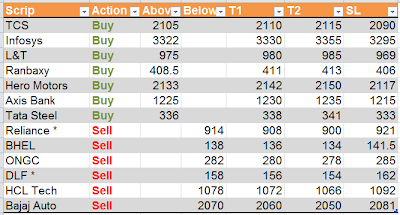 For positional trading with a holding period of 2-3 weeks, suggest buying in the following stocks with strict stoploss. Please book half the holding at first target and revise stoploss to buying price. Keep watch on index also. Nifty is unlikely to cross its previous high. Please start booking profits when Nifty reaches these level. 4. 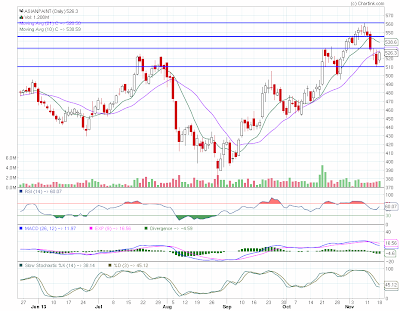 Bank of Baroda - Buy above 610 for a target of 620-640 with SL at 593. Nifty was very volatile today (Nov 12) and hence we abstained from trading for the day. 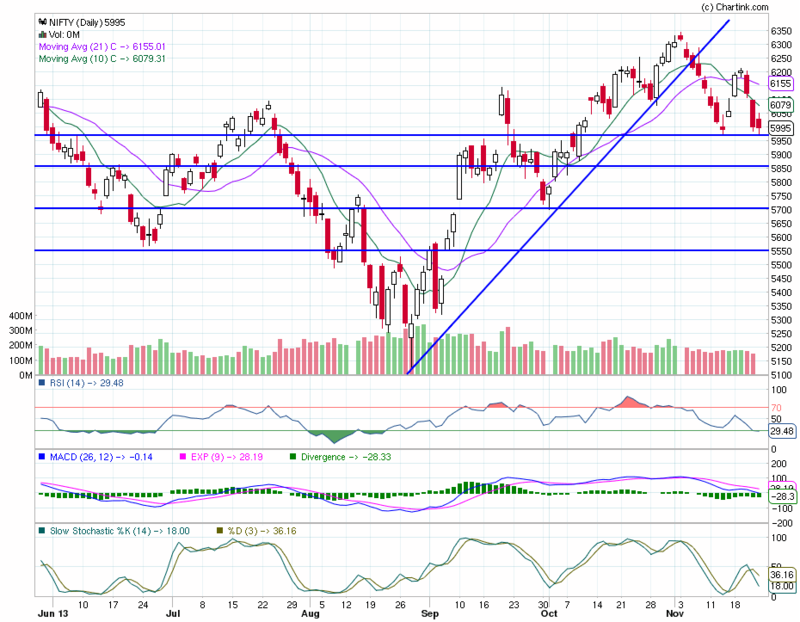 Nifty has now broken the critical support level of 6080 and hence any bounce backs will be sold off. 6000 is the immediate support followed by 5980-50. Bounce back is possible from 5950. Due to volatality, number of calls will be less for few days. Tata Steel is a very risky call. Please trade according to your risk appetite, Please keep strict SLs. Today was very volatile, we ended with no profits / no loss. It is better to wait and watch till the volatality subsides a bit. Nifty closed just above our level of 6140 after the bounce from 6120. All these levels were identified in the pre-market calls on Friday. Please read the pre-market calls for the last trading session here. With the overnight rally in US markets, markets are likely to hold this support and try to bounce back to the resistance level of 6200-30. For intraday trading on Nov 11, for markets to be positive, the level to be maintained is 6150. Above 6175 good move to 6200-30 could be observed. Exit all longs if Nifty slips below 6100. 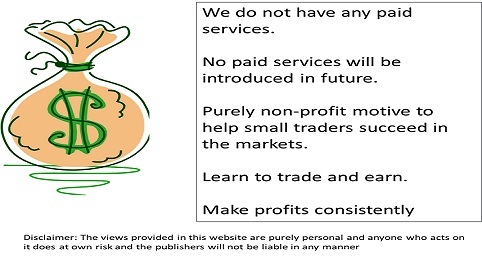 Please refer to our unique Intraday Trading Systems to trade yourselves. Did you make profits of Rs. 22,000/- last week in trading ? Our readers made a total profit of Rs. from pre-market calls. Please see the details below. Please check archives for the calls and trading results. 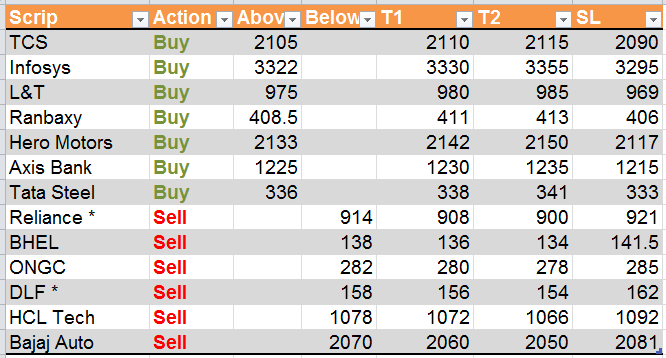 Details of trades on Friday 08 Nov.
We had written on Nov 6 about Nifty divergence and sell signals from daily charts. 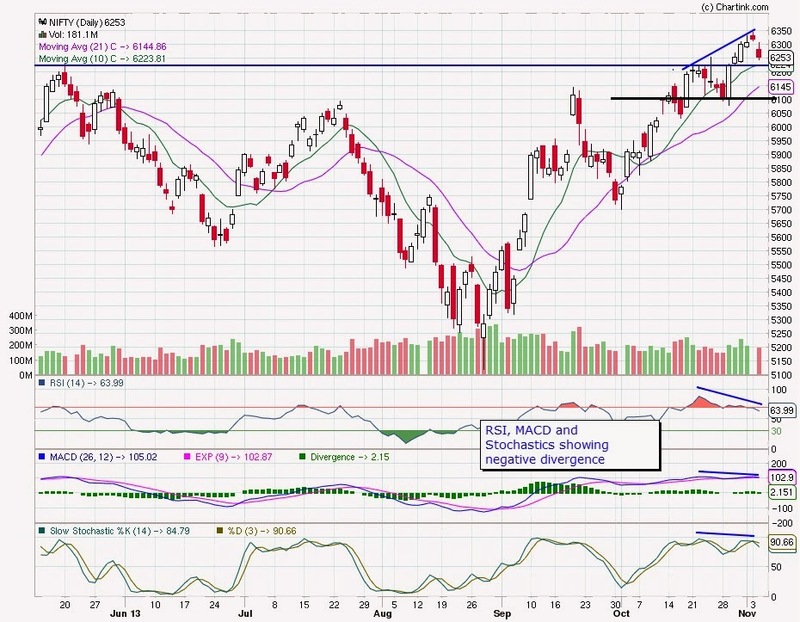 Please read the post here - Nifty Technical Analysis and Intraday calls for Nov 6. Nifty started falling continuously from that point and the crucial support of 6230-6200 is broken. Next support is at 6170 , 6140 and 6100. 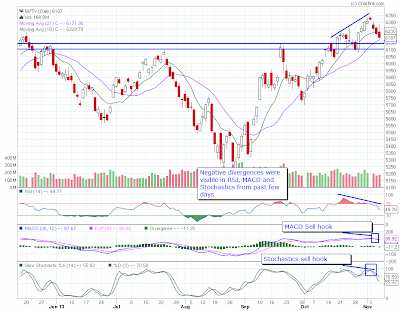 Nifty has clearly given sell signals with RSI closing below the 70 levels, MACD sell signal and Stochastics sell. Technically, this correction could go up to 6080 in the next few days. This view will continue until Nifty crosses 6230 on closing basis. For Intraday trading on Nov 09, Nifty will be negative below 6200. For any kind of bullish move, market should cross and sustain 6230-50 range. On the downward side, support exists at 6170-6140 and 6120. Bounce backs are possible from these levels. Highly volatile market today, the entire range of resistance and supports were tested. However our readers made good profits on small number of pre-market calls. Hope everyone enjoyed. Despite volatility we made profits in pre-market calls. Since more calls got triggered, we have two stoplosses. Read the pre-market calls here. As written in yesterday's pre-market analysis (Nifty Technical Analysis and Intraday calls for Nov 05) , Nifty was in correction mode and closed just above the critical level of 6250. 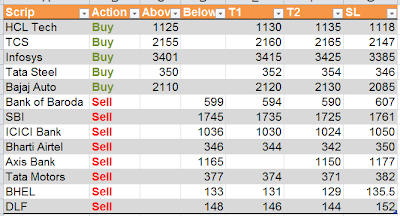 Most of the swing traders were in profit booking mode from the Diwali session onwards and this is the reason, we had written not to buy any Muhurat or Diwali picks. 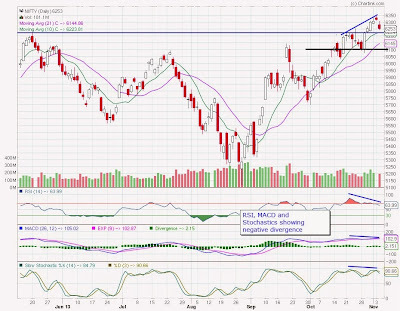 RSI , MACD and Stochastics are showing negative divergences in the daily chart indicating weakness in the upward move. Also, please use these corrections to enter our long term portfolio. 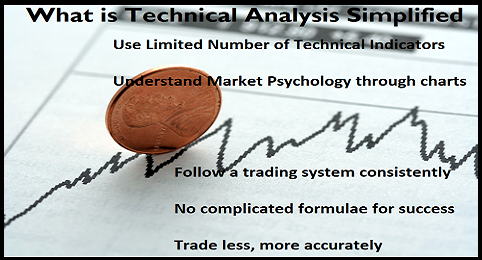 Long Term Investment portfolio from Technical Analysis Simplified. We can think of two buying zones as you see below - One is at the support level of 6200-6230 and the next at around 6080-6100. As written yesterday, I we will publish a mid cap portfolio at the right time. I have already added few stocks to the watchlist and observing for the past few weeks. 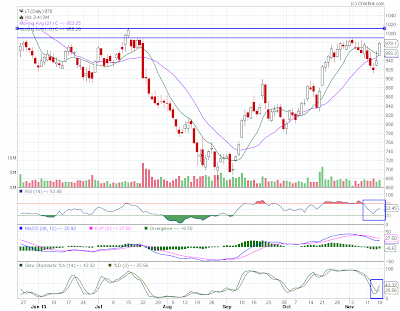 For Intraday trading on Nov 6, Nifty needs to be above 6280 to remain positive. 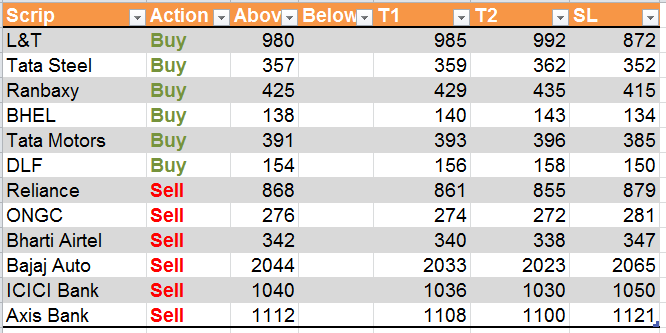 Below 6230, Nifty will be negative and next support level is at 6200 and 6080. Most likely Nifty will take support at this levels. On the upper side resistances are placed at 6280 and 6300. Above 6300, there will be bullish momentum which can take the market to next resistance level of 6320 and 6350. We had two calls triggering today in the volatile session , both hitting the first targets. Hope everyone enjoyed. 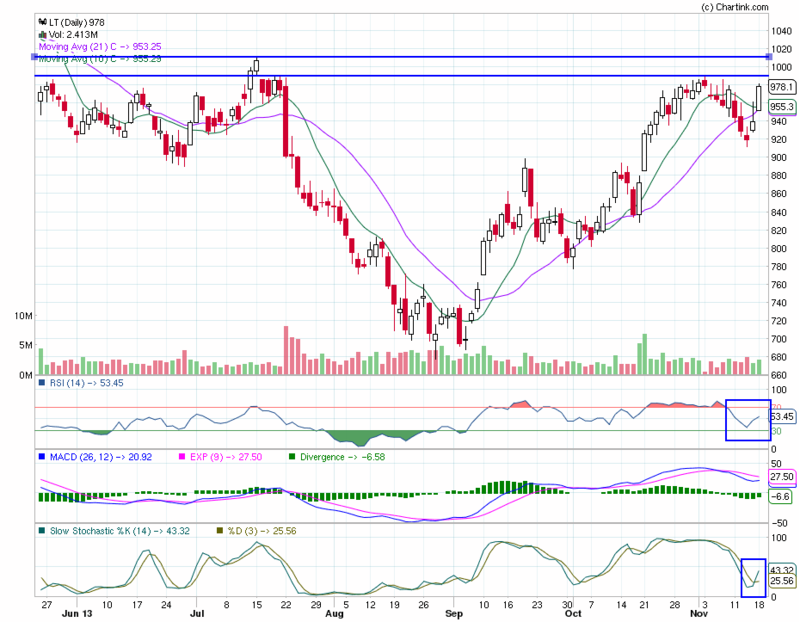 Nifty need to cross 6355 to continue bullish momentum. Overcoming this seems to be tough with chances of profit booking this week. Next resistance is at 6400. On the downward side, the support is at 6280 for intraday trading on 05 Nov. Exit longs below 6250. Those who wish to buy Diwali or Muhurat picks, do not buy now as advised by every broker and TV channels. Wait to buy at levels of 6100-200. Markets will correct to this level soon. I will be publishing a mid-cap based aggressive portfolio when the markets come down. We entered into our long term portfolio in September, when the markets were quite indecisive and either side movements were possible. This week markets touched all time high and so do our portfolio. 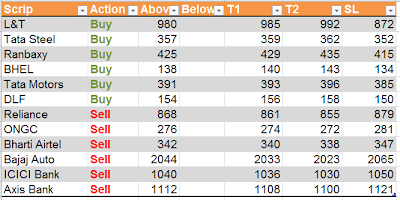 There are some stocks which are still in the buy zone, while others may be added on dips of 5 to 10%.